Visitor Fields are the pieces of information you wish to capture on the iPad when a Visitor signs in. 'Visitor Field One' (Full Name) and 'Visitor Field Two' (editable) are two fields that are required for each visitor. We require two fields in order to accurately save each visitor into the SwipedOn database. 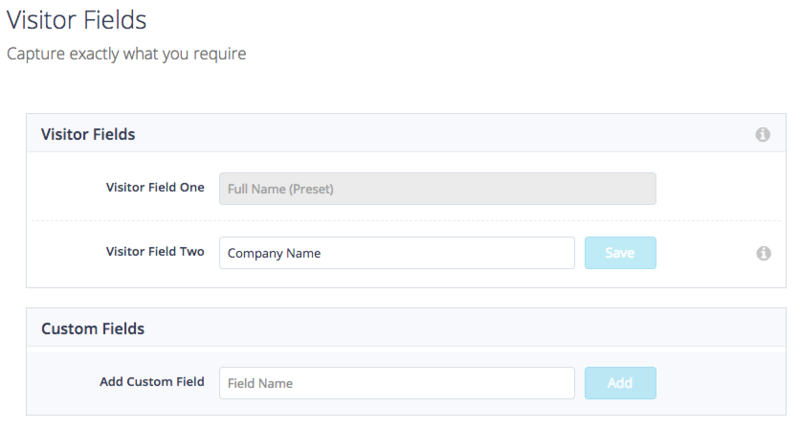 You choose to capture additional information from your visitors by adding Custom Fields. Once added, you can reorder the additional fields by dragging and dropping them into place. Show on iPad: This will mean the field is visible on the iPad to the Visitor. Required: This means that the field is required and the Visitor will not be able to progress unless they fill it out. Visitor Categories are where you can make categories of Visitors which are displayed as a drop down in the sign in process. These categories can then be modified slightly so that the requirement to select an Employee can be disabled. This is handy when you have a regular Visitor (such as a partner firm or contractor) who needs to sign in, but does not necessarily need to meet an Employee.